A new timeline for the origin of ancient Egypt has been established by scientists. A team from the UK found that the transformation from a land of disparate farmers into a state ruled by a king was more rapid than previously thought. Using radiocarbon dating and computer models, they believe the civilisation's first ruler - King Aha - came to power in about 3100BC. The research is published in the Proceedings of the Royal Society A. Lead researcher Dr Michael Dee, from the Research Laboratory for Archaeology at the University of Oxford, said: "The formation of Egypt was unique in the ancient world. It was a territorial state; a state from which the moment it formed had established borders over a territory in much the same way we think of nations today. "Trying to understand what happened in human history to lead people to establish this sort of polity we felt was a gap in understanding that needed to be filled." Until now, the chronology of the earliest days of Egypt has been based on rough estimates. With no written records from this very early period, a timeline has been based on the evolving styles of ceramics unearthed from human burial sites. Now though, scientists have used radiocarbon dating of excavated hair, bones and plants, with established archaeological evidence and computer models to pinpoint when the ancient state came into existence. Previous records suggested the pre-Dynastic period, a time when early groups began to settle along the Nile and farm the land, began in 4000BC. But the new analysis revealed this process started later, between 3700 or 3600BC. The team found that just a few hundred years later, by about 3100BC, society had transformed to one ruled by a king. Dr Dee told the BBC World Service programme Science in Action: "The time period is shorter than was previously thought - about 300 or 400 years shorter. Egypt was a state that emerged quickly - over that time one has immense social change. "This is interesting when one compares it with other places. In Mesopotamia, for example, you have agriculture for several thousand years before you have anything like a state." Archaeologists believe Egypt's first king, Aha, came to power after another prominent leader, Narmer, unified the land. The team was also able to date the reigns of the next seven kings and queens - Djer, Djet, Queen Merneith, Den, Anedjib, Semerkhet and Qa'a - who with Aha formed Egypt's first dynasty. The model suggests that King Djer may have ruled for more than 50 years. This is such a long period, it raises the possibility that there may have been other kings or queens of Egypt that we do not know about or that the state may have collapsed and reformed. 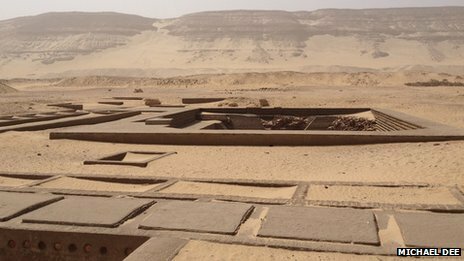 Commenting on the research, Prof Joann Fletcher from the department of archaeology at the University of York, said: "This is highly significant work, which pulls the beginnings of Egypt's dynastic history into much sharper focus - it is tremendously valuable to have such a precise timeline for Egypt's first rulers. "The study also has ramifications for the earlier pre-Dynastic period, allowing us to better understand these key periods of transition."